these are two of my latest rock posters. the poster on the left is for Matt & Kim, a duo from Brooklyn, NY. their debut album, composed of only drums and synthesizer, is full of complex sounds. 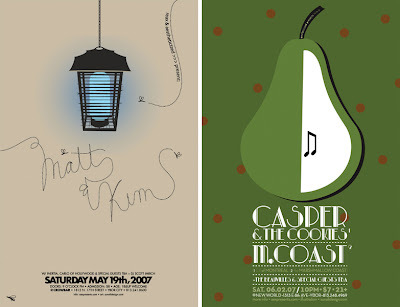 Matt & Kim are playing at Crowbar in Ybor City on Saturday, May 19. the poster on the right is for Casper and the Cookies and M. Coast, aka Marshmallow Coast. Jason NeSmith (aka Casper Fandango, ex – Of Montreal), is the lead singer and guitarist for Casper and the Cookies. their sound is full of energy and very upbeat. Casper and the Cookies and M. Coast are playing at New World Brewery in Ybor City on Saturday, June 2. Me likey! You are so talented. I love the graphics, colours etc. Do you actually get to meet these rock stars? That would be too cool. I wish I got to meet them. that would rock so much, that it would put the “rock” in rock posters. i love that matt and kim one too!